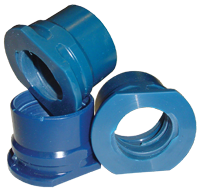 Designed for use in shock, sliding, low temperature, and gritty environments. Redco™ 750SXL has excellent self lubricating characteristics which make it ideal for applications which may experience dry running periods. 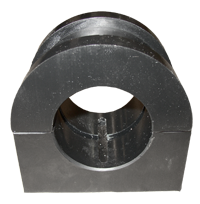 Bearings, bushings, wear plates, channel, liners, seals, hanger bearings, washers, liners, flotation cell parts, retainers, idler bearings, etc. 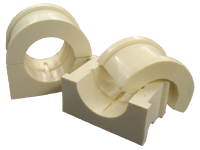 Split bearings allow for easier maintenance by simplifying replacement and are frequently used as support bearings for drive and screw-conveyor shafts. Typically, these industrial shafts are enclosed with a housing or conveyor trough. They are also commonly used in veneer and gypsum board dryers and fit all dryer configurations. Durable polymer alloys capable of performing better than brass, bronzeor Babbitt! 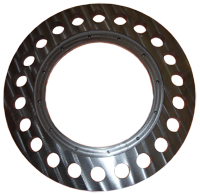 Designed specifically for bulk handling, forestry, mining and transportation. 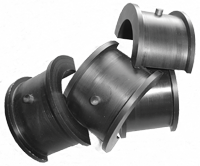 Mill operating temperatures of -28°C (-18°F) through 40°C (100°F) present no problem for UHMW/PE or Redco™ 750. 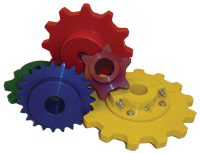 Redco™ 750 Sprockets are more dimensionally stable and can take higher temperatures (250°F). Redco™ 750 has a specific gravity of 1.3 (sinks in water) vs. UHMW specific gravity of 0.936 (floats in water). Redco™ 750 has a memory allowing the teeth to hold their pitch better than UHMW.